A real home management problem—and a timely one—is this story involving the health and pocketbook of the Paul Schuster family of Cuyahoga Falls, Ohio. When they learned they were to have a second child, they realized they'd need some sort of help, for it was right in the middle of the gardening and food-preservation season. Knowing that domestic help was too costly, they promptly made the smartest decision of their lives. They bought a freezer and "it has turned out to be one of the best, quietest, neatest mechanical helpers anywhere!" 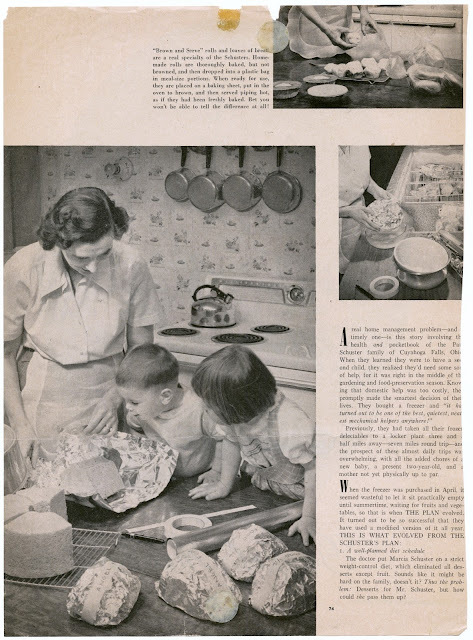 Previously, they had taken all their frozen delectables to a locker plant three and a half miles away—seven miles round trip—and the prospect of these almost daily trips was overwhelming, with all the added chores of a new baby, a present two-year-old, and a mother not yet physically up to par. The doctor put Marcia Schuester on a strict weight-control diet, which eliminated all desserts except fruit. Sounds like it might be hard on the family, doesn't it? Thus the problem: Desserts for Mr. Schuster, but how could she pass them up? Sadly, the text stops at this point. "Brown and Serve" rolls and loaves of bread are a real specialty of the Schusters. Homemade rolls are thoroughly baked, but not browned, and then dropped into a plastic bag in meal-size portions. When ready for use, they are placed on a baking sheet, put in the oven to brown, and then served piping hot, as if they had been freshly baked. Bet you won't be able to tell the difference at all!